Oil-filled for maximum heat dissipation and constant lubrication. Includes discharge pipe inside basin. UL, CSA and SSPMA listed. Installs above floor – no need for sump. The Hydromatic 118-5 Hide-Away Basin System is here for the professional plumber. This package is an economical, above floor, under the sink system. The Hydromatic 118-5 Basin Hide-Away System allows you to add a drain without adding the headache of major remodeling (i.e. cutting concrete to install a basin). The 118-5 Hide-Away Basin System is a solution for immediate installation as well as a great idea for retro-fitting. The compact polypropylene water box with outside dimensions (see dimensional drawing) is ideal for small places. Although compact, it has the capacity for washing machine discharge, laundry trays, utility sinks, wet bars and air conditioning or dehumidifier drainage. 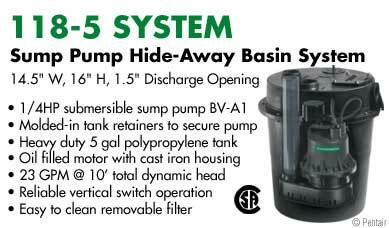 At the heart of the Hydromatic 118 Hide-Away Basin System is the BV-A1 sump pump. This 1/4 HP heavy-duty sump pump is a proven Hydromatic design that runs on 115 volts. The oil-cooled motor also has built-in automatic thermal overload protection and a 10’ power cord. The compact basin and BV-A1 pump makes the Hydromatic 118-5 Hide-Away Basin System a value-packed package for the professional plumber.